Adult braces are becoming an increasingly common choice for older patients wanting to undergo orthodontic treatment. 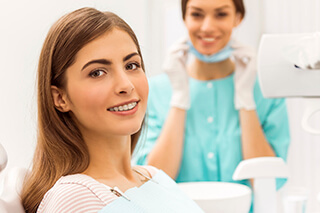 Options like Invisalign offer a fast, practically invisible solution to dental misalignments, and your dentist in Fort Worth offers older teens and adults this wonderful option for straightening teeth. 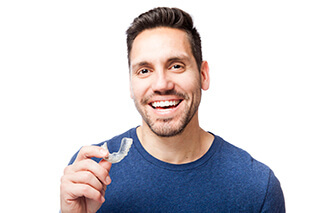 Learn more about the Invisalign treatment, and learn why nearly one million Americans over the age of 18 are choosing adult braces for smiles that look (and function) better! 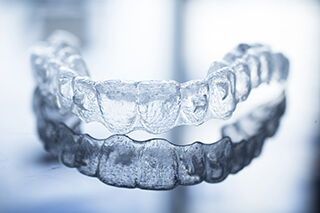 The Invisalign system consists of a series of clear plastic aligners that put pressure on certain points of your teeth throughout the treatment. 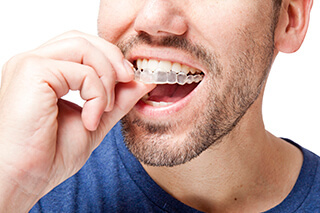 The smooth, plastic aligners are custom fit to correct your unique bite, and you wear each one for about two weeks before advancing to the next in the system. The average Invisalign treatment lasts about one year. Most patients with minor to moderate orthodontic issues are good candidates for the Invisalign system. An initial checkup should be performed to ensure teeth and gums are healthy before undergoing orthodontic treatment. For adults weighing their orthodontic options, Invisalign often offers the most significant benefits. Let’s take a look at the key differences between traditional orthodontics and clear braces with Invisalign. When considering the differences between Invisalign and traditional metal braces, most busy adults agree that the benefits of Invisalign far outweigh those of the alternative. Once you’ve begun treatment for Invisalign, it’s important that you keep your aligners clean to prevent bad breath and an increased risk of tooth decay. Fortunately, it’s not so difficult to keep the trays clean -- just make sure you’re rinsing them upon each removal, as dried saliva and plaque cause serious odor issues. And when you’re not wearing your aligners, soak them in a denture cleaner or with the special Invisalign cleaning crystals to keep them as fresh as possible. Brush your aligners gently with a clear anti-bacterial soap before reinserting them into the mouth. Are you intrigued by the promise of discreet orthodontic treatment? If so, don’t wait to learn more about Invisalign -- including whether or not the treatment might be the right solution for your dental misalignments. Please contact David Tillman DDS to request your appointment today!